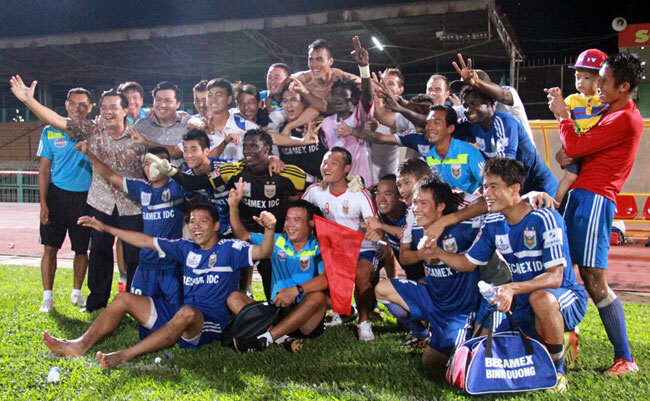 HA NOI (VNS) — Becamex Binh Duong will start their V.League 1 title defending journey with a clash against ambitious Can Tho in the national premier league 2016 opener on February 20. Kicking off the season on February 14 will be the Super Cup match between Becamex Binh Duong, the V.League 1 winner and Ha Noi T&T, the National Cup's runner-up. The draw also brought last season's phenomenon Hoang Anh Gia Lai to play promoted Ha Noi FC in their first match with the latter as the hosts. "It will really an interesting match which will lure a lot of fans as both of us will show our young line-ups. Hoang Anh Gia Lai will be suitable rivals who have more experience than us at V.League 1, but we will play on our home ground," Dong said. The team which stands in 14th position will be relegated. The 13th team will have to play a match against the winner of play-off matches between V.League 2's runner-up, third-placed and fourth-placed clubs for the last berth at V.League 1.